It may take a moment or two to load all the pictures. Awesome Chevy belonging to Jim Curio, and Jacque King's 1976 Dodge 300 ambulance/rescue. 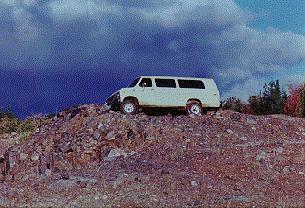 A camper van that can go anywhere, Larry Hogans "Pathfinder" E250, and Ken's custom E350. Coming soon, some vans from Iceland and a page on IFS installation in Econolines. More details about any of these by clicking on any individual picture or caption. 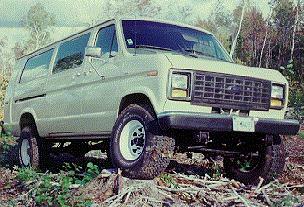 Tell us about your 4wd van or send pictures. and what you do with it. Write in to sbest@glinx and share it with me. Click to subscribe to 4x4van newslist and share with all of us. http://www.sofcom.com.au/4WD/Steyr/Pinzgauer.html Wow, now this is the van I really want! http://bauer.simplenet.com/jbauer/ John has an awesome monster van here, have a look! Hey, this guy deserves "Honourable Mention". This is Mark Strickland's 1984 Ford E150 2 wheel drive van with a Lockright Locker and air shocks in the rear and Pathfinder 30x9.50 tires. Mark hails from Tucson Arizona where lack of rainfall makes this a very viable alternative. More pictures at his website. We have 4 kids, a big family now-a-days, and we like to travel. To cart our large family around we needed some serious room. A mini van would take us all but it would be loaded to max and have little room for our luggage. So I bought a Ford E350 15 passenger van. It gave us the room but was terrible in winter snow. My answer to that was to convert it to fulltime 4 wheel drive! 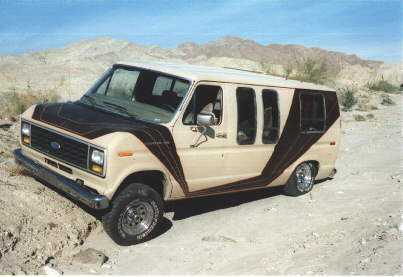 The van started life as a 1987 E350 extended XLT Clubwagon, with 6.9l (420cid) diesel, auto transmission, air conditioning and dual fuel tanks. It is big, heavy, and underpowered, but it easily carries my four kids and their friends on a daily basis and is relatively good on fuel (10-20mpg). I installed a NP203 full time transfer case from a 1970's Ford 4x4 because it was available, cheap, tough, and would fit my oddball transmission. I really like the fulltime system and my wife doesn't have to figure out when to pull levers or lock hubs. The front axle is from a 1978 F250 Ford pickup, and is connected to the frame by the 1978 F250 truck leaf springs. 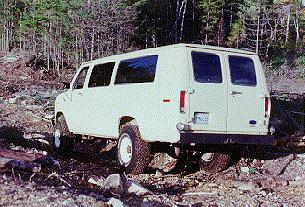 The original van rear axle is lifted 3" with the stock Ford 3/4 ton lift blocks from the 1978 pickup. The 3" lift easily allows the 35"x12.5"R16.5 BF Goodrich All/Terrain tires to fit, although this is probably the maximum size that would fit. For steering linkage I used a tie bar (that connects the spindles) from a 90's F350 with a shortened original van draglink that connects to the stock van steering box in a side to side fashion similar to what came on the van (instead of the original 1978 truck "fore/aft" system). This is a tough, simple system that holds it's toe in very well. Unfortunately due to the high position of the steering box and the low position of the tie bar it is impossible to install this perfectly level. Any serious angle to this bar induces bumpsteer as does any side movement of the axle. Luckily with the 3" wide leaves and only 3" high lift these effects are not noticeable. With a 2" or 3" lift these effects are slight and most folks don't expect their 3 ton camper van to handle like a Ferrari. 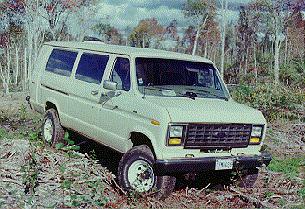 All the details on converting a Ford van to 4wd, click here. As I write this we we getting yet another good dump of snow, it has been a wonderful winter for the snowmobiles, and a great challenge for the old Monster Van. School was canceled and I'm not working today so we stuffed some lunch into us, packed all the kids into the Giant Banana Wagon (it's a bland yellow colour) and headed off to the coasting hill. What a ball this machine is! My snow plow guy makes a point of plowing all the snow in front of the van, just as a challenge. My wife has no trouble tooling this thing around on a snowy day. She is more mechanically in tune than many guys and since we have owned several 4X4's in the past she has an idea how these things work, but the fulltime system is foolproof. Unless you have a couple feet of heavy snow, locking the transfer-case differential is not really necessary for traction, but it does help braking on the slippery stuff a bit. This van is now extremely sure footed in snow, which is a complete reversal of its previous 2wd character. This was one of the major considerations for doing the conversion. On dry pavement the ride is not quite as good as when it was 2WD. The friction from the leaf springs and the high unsprung axle weight give a harshness to the ride inspite of relatively soft springs. Independent front suspension (IFS) and coil springs would really help here. The heavy front axle requires stiff shocks to keep it under control which adds to the ride harshness. It handles as well as the original 2WD system with the exception of the slightly increased "road harshness" transmitted by the leaf springs and heavy front axle. It still corners well, but tends to bounce and pitch a bit more, I do on occaision push it to the extreme and there is no rollover tendency. The extra height is sometimes a bit of a bother but useability is fine. The first step out of it is a big one though. I really do push the old girl out into the boonies. This is no driveway queen, it is our everyday family stationwagon and hauls us on long trips on vacations and out camping in the boonies. It is a bit wild looking with the 3" lift and the 35" tires. With the big extended van we have the first and last bench seats removed. This makes a nice 4' spot to put groceries, coolers etc. It also made it easier to put the kids in car seats when they were younger. A side benefit is when they quarrel/bicker/sing/chant/throw stuff, it is 4 feet further away from you. They still have 2 three passenger seats to choose who sits where, and I am too far away to be called upon as a referee. I love it. Tried a longish trip with everyone packed into the Crown Vic a while back. Nearly drove me nuts! Nova Scotia is a rugged coastline with a wooded interior. We go camping on the shore, away from the crowds. My preteen kids love to drive it offroad, they pull the seat ahead and are pretty good at negotiating stumps and woods trails while I sit back and grey my hair. When traveling we can go where we please. Investigate that cabin on the hillside, have a picnic down by the river, or watch the comet from the top of the mountain. We use topographical maps to take the old abandoned road or rail line to that deserted beach, crossing the brook where the bridge used to be. I can be pretty creative at getting out of traffic jams if it looks like it is going to be a while. The boat launch is never too slippery and at public events we can always find an out of the way place to park. My oldest daughter says: "Daddy, don't ever sell this van, it's got too many memories." 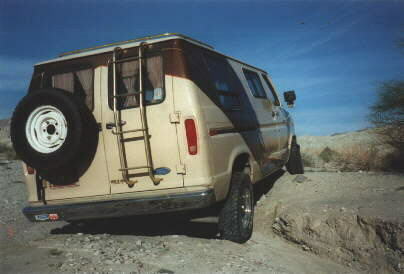 Our van being an E350 had rock solid rear springs. Over any type of bump the kids would scream as they were flung against their seat belts. I had originally reinstalled the front anti-sway bar but with it and the stiff rear springs the van axles would not articulate enough to handle uneven terrain without lifting tires, making it disappontingly poor offroad! I removed two rear leaves from both sides. Back seat ride is much better now. Softening the rear springs and the wide stance of the relocated (wider) front leaf springs (which give more roll stiffness) meant the front anti-sway bar could be safely removed. The front anti-sway bar on the E350's is actually there only to maintain understeer by balancing the high roll-stiffness of the extra firm rear springs. Originally if the front swaybar wasn't in place the stiff rear springs of the van would lift a rear tire on hard cornering and loose traction before the front, resulting in an out of control spin. Even with two leaf springs removed we still don't have to use the torsion bars when towing our 21' trailer. Of course you can feel slightly more body roll on hard cornering but the van retains enough understeer to be completely safe (I do push it hard at times!). 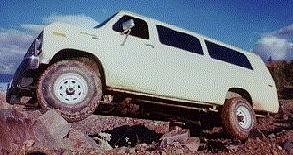 This extra suppleness increased offroad capability by a factor of 3! No kidding! Long soft travel is what you need offroad. Balance and stability are what is needed on the highway. Mine is an extended van which means it has a lot of rear overhang. The trailer hitch used to drag all the time off road. I removed it and installed a hitch receiver in the center of the channel steel rear bumper. This means I have to use a very dropped (8 inches) hitch which had to be made very strong. Front approach angle and visibility are excellent with a van. Remember all the times you had a pickup on the crest of a steep hill. You couldn't see over the hood ahead of you? Not so with a van, and with the seats so close to the door, you can easily look out and see your front tire. The excellent front approach angle is nullified by the long wheelbase and rear overhang of my extended van . (the Hummer uses its smooth underbelly skid-plates to get by this, hmmm, idea...) A short wheelbase van would really take to the hills and turning around on trails or parking lots would be much easier. The diesel is underpowered but very economical. This thing will idle forever on a pint of fuel and gets in the high teens (larger Canadian gallons remember) regardless of how you drive it. The worst fuel mileage ever was 11 mpg(CDN) hauling the travel trailer as fast as it would go on interstates. As a 2WD we got 25 mpg average on good smooth highways, but with the extra weight and height of 4WD it seems our best is 20mpg. The diesel accelerates slowly which greatly helps its traction in mud or snow. The diesel is noisey, smokes and stinks on cold startup and can be tricky to start in cold weather. It is slow to warm up and does not give off much heat in cold weather but will never stall once started. Mine has 280,000 km and has only ever had the waterpump and alternator replaced. Diesels are definately an aquired taste, but they sure do keep a truck this size an affordable joy to drive. Have a look at Jason's Powerstroke Page, well worth it. The van tends to attract attention where ever you go. It isn't too bad with the 235/85R16 Michelin winter tires, but with the big 35"x12.5" BFG A/T's I run in the summer you definately get to talk to a lot of new folks. 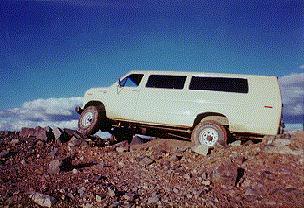 Fellows wander over at campsites to ask "is that really 4 wheel drive? ", kids shout "all right!" at street corners and gas attendants ask "where'd you get this?". When folks ask my wife why the tires are so big, she is probably pretty accurate when she replies: "It's a man thing!" You will never loose it in the parking lot. The height, visibility and view make it surprisingly easy to get around in city driving. I used leaf springs for the ease of locating the front axle on this "had to succeed" effort. 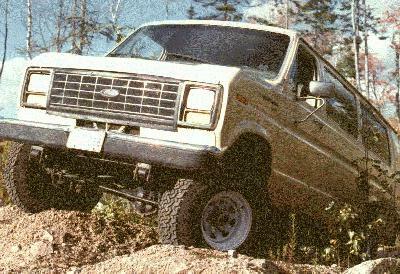 Next time I will probably still stick with a solid axle for rugged dependability but would like to use coils with rear mounted links and track bar like the pre-1979 Ford 1/2ton and "Pathfinder" conversions used or even better a 4 link system like the Quigley conversion or the new Dodge 4x4. The smooth travel and articulation of the coils would be a great relief from the slight "small bump" harshness of the leaf springs. A Panhard rod (also called a track bar) or a dropped Pittmann arm would also eliminate any bumpsteer tendency even with a leaf-spring conversion. The extra rear extention of a Maxi-van means great cargo capability but limits its offroad ability a bit. A short wheel base van would be a real joy on trails. I had to back up with a ground guide over half a mile on a twisty trail once when I just couldn't fit between two trees or turn around. As with any lifted vehicle, the view over the roofs of traffic is nice but there are problems. It is too tall for most underground parking. Likewise it is too tall for most standard home garages, although I can get the nose in some garages if I almost deflate the tires. Like any fullsized vehicle now-a-days it can be hard to get parked in cities as it is longer than some parking spaces.